"Within the inner sanctum, the central altar had been moved across the dais, and there were signs of excavations all around it. The sound of the muttering continued as if our intrusion had gone unnoticed, and it came from behind the altar. 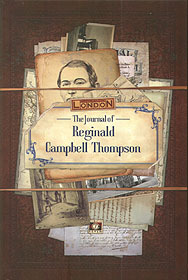 Upon investigating , we were all seized with an unimaginable terror"
As part of Cubicle 7's Cthulhu Britannica line The Journal of Reginald Campbell Thompson is both a fascinating standalone work of Call of Cthulhu fiction as well as a deluxe, in-world artefact for use with the London-based The Curse of Nineveh campaign.